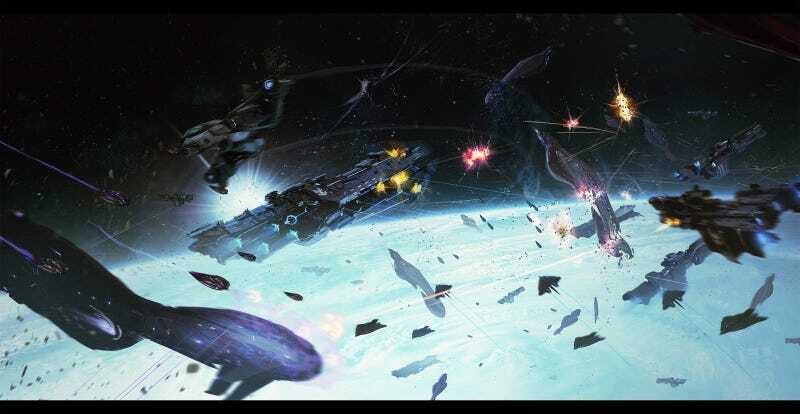 Images from the proposed Halo Wars 3, showing massive space battles. A new collection of concept art reveals details of a Halo Wars 3 pitch that featured space battles and XCOM-esque base management. Halo Wars 2 managed to capture the feeling of Bungie’s famous franchise but wasn’t that intense of a strategy game. A handful of art, shared by Creative Assembly concept artist Brad Wright, offers a glimpse into a pitch for Halo Wars 3 that would have expanded the scope of combat and added additional strategy elements. A mock up showing the pitch’s base management. Different rooms would offer statistical bonuses. Some rooms would affect the performance of your ship in space battles. The pitched artwork helps break down a base management system where players could customize and outfit their main spaceship with various rooms. Players would be able to hover over them to reveal their stats boost, as well as zoom in to explore in more detail. These rooms could be upgraded to affect ship performance in space battles. It highly resembles the way players expands their base in XCOM, with new rooms offering benefits to soldiers and defenses. While this particular pitch was canceled, it offers an intriguing look at some of the options Creative Assembly were considering for the next game. Maybe some of it will carry over to a third Halo Wars, if that ever happens. I’d love to manage my own giant, Spartan-filled space base. You can look at all the art here. It’s awesome.